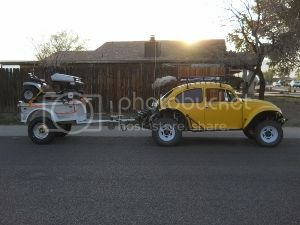 AzBaja.com, Home of the VW Baja Bug -:- Baja Forums -:- AzBaja.com Members -:- Projects and Builds -:- Thinking. Not VW related. 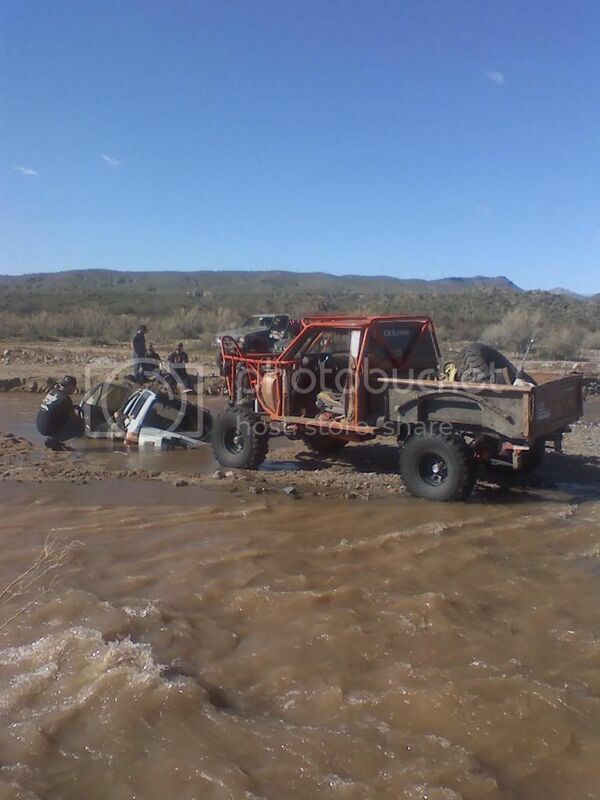 Baja Forums -:- AzBaja.com Members -:- Projects and Builds -:- Thinking. Not VW related. Post subject: Thinking. Not VW related. I know a lot of people with 4x4s that off road and they have been bugging me to get one. My reply was always 1. I don't like to go at a snails pace. 2. If I can run Upper and Low Ajax and 99 .9 % of you can't why should I? I started thinking it would be cheap to to convert my 82 GMC to 4x4 and picked up a granny gear 4 speed, king of the transfer cases np205, flat top Dana 44 front diff and military 36 "Hummer tires. I started opening up the front fender wells for large tires. 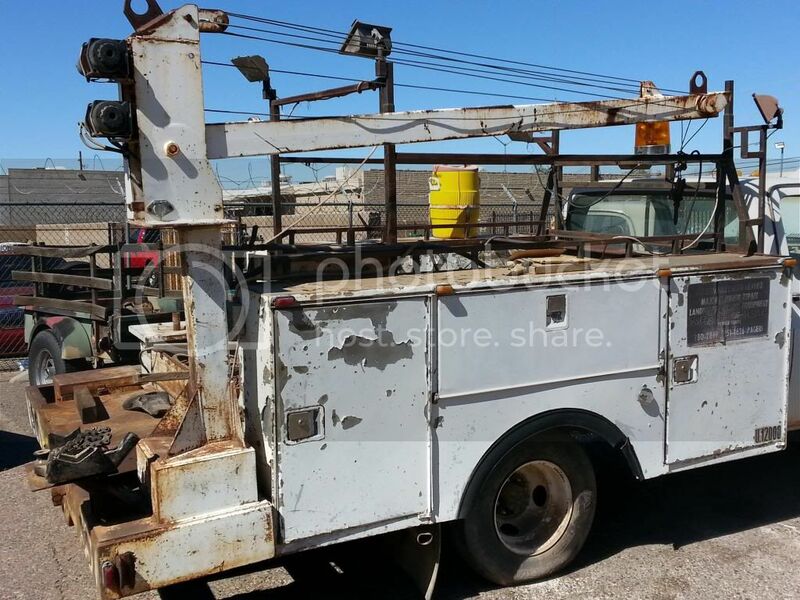 Then last month I find a functioning one ton 4x4 with a granny gear 4 speed, Dana 60 front diff with 4.56 gears. Now I'm thinking even though it will take some time to remove the crane and box and the front fenders I am modifying won't fit, I only have to find dually 16.5 rims to put the Hummer tires on it and remove some spring leaves and lincoln lock it, I do have an assembled 4x4 with a heavy duty frame and minimal emission requirements. 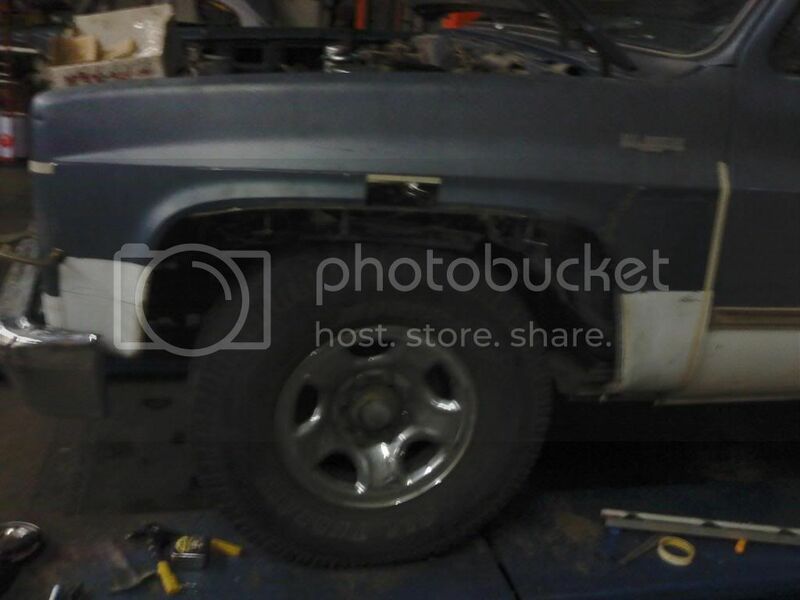 So about the same work as converting my GMC. Two days ago I find this. Yesterday I sell one of my cars on CL and bought it. It ran away from its owner and drove driver less into the neighbors house across the street. I'm thinking again needs a bit of work with a portopower to get a new windshield to fit, and a couple of braces for the tool box and rear shock hoops but now I have a fuel injected 454, granny gear four speed, Detroit and E lockers instead of Lincoln lockers, new radiator, belts, hoses, wheel and diff bearings, 40 " Boggers instead of 36" tires, I'll need to sell the dually wheels, Dana 44, spare 4 speed/205 transfercase and the other one ton, but my modified fenders will fit. I may need to stop thinking ? Nah it has worked so far. Nice find. Should be a lot of fun. We picked up a Cherokee as our basher / trail rig. Soon as Dune season is over we will get going on that one. 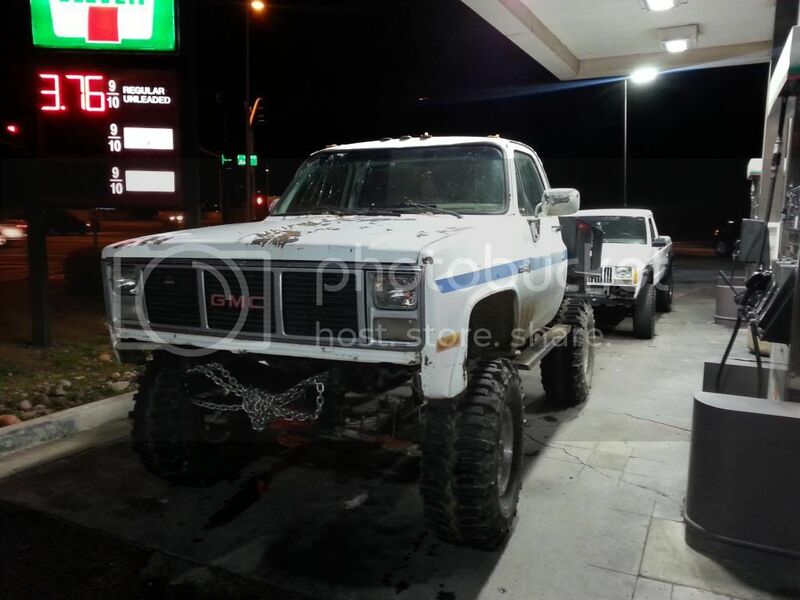 I see you posted a picture of the truck in it's most comfortable environment - the gas station. Post subject: Re: Thinking. Not VW related. I went to the shop this morning and fixed a couple of bad things on it and went to Sycamore. It climbs like mad in four high with the Swampers only thing was in four low I only had front wheel drive. Another thing to fix. looks like a awesome starting rig. should post up some more pics. Took it out Saturday and Sunday to Sycamore Creek. With its 52.3 to one first gear final ratio it crawls anywhere it can get traction except for me it is hard to go that slow and my faovorite trails are to twisty for it. There were a lot of multi point turns yesterday. 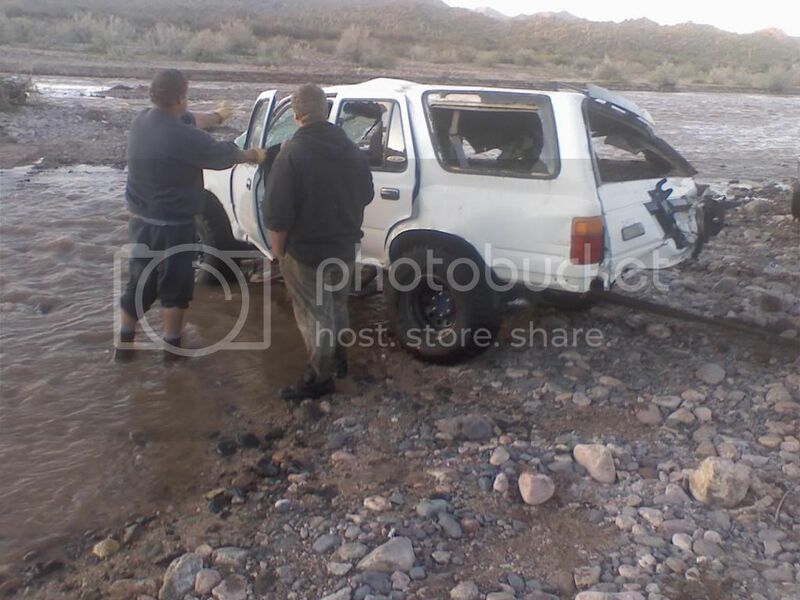 Main entertainment was this truck that was stuck in the creek. There were at least 20 people 10 shovels there working from Sat morning to Sunday after noon before it got freed. The fine has been upped from 15 to 30K for leaving it there more than seven days. Nothing sinister, just two brothers going camping in two trucks doing a night crossing and one got stuck. 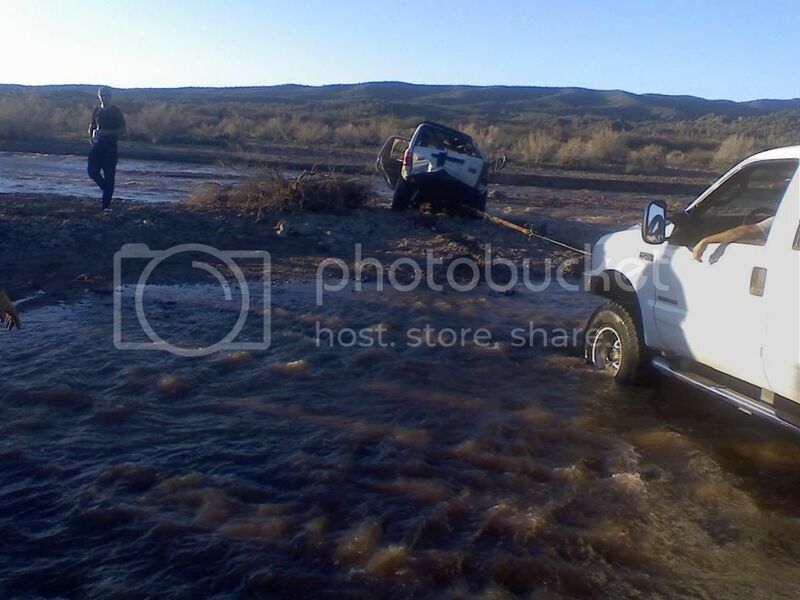 The camped on the north side only to find the water over the top of the truck by Saturday morning. did I get that $30,000 ???? Plus the cost of trashing the car....OUCH!!! !